This chapter introduces InterSystems IRIS Business Intelligence models. The widgets on a dashboard are driven by pivot tables and KPIs (key performance indicators). For a pivot table, a user can display a listing, which displays source values. A pivot table can respond to runtime input such as filter selections made by the user. Internally it uses an MDX (MultiDimensional eXpressions) query that communicates with a cube. A cube consists of a fact table and its indices. A fact table consists of a set of facts (rows), and each fact corresponds to a base record. For example, the facts could represent patients or departments. Depending on your configuration and implementation, the system detects changes in your transactional tables and propagates them to the fact tables as appropriate. 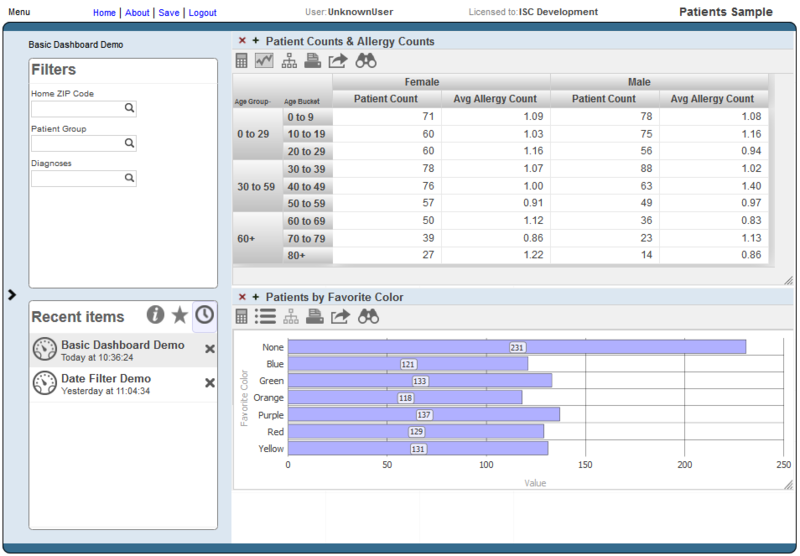 The system generates an MDX query automatically when a user creates the pivot table in the Analyzer. A KPI can also respond to runtime user input. Internally, it uses either an MDX query (with a cube) or an SQL query (with any table or tables). In either case, you create the query manually or copy it from elsewhere. A listing displays selected values from the source records used for the rows of the pivot table that the user has selected. Internally, a listing is an SQL query. 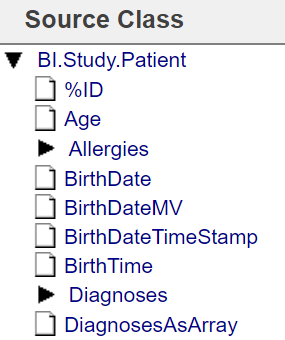 You can specify the fields to use and let the system generate the actual query. Or you can specify the entire query. Within the Analyzer, you create pivot tables. Each pivot table is a query that you create by drag and drop actions. 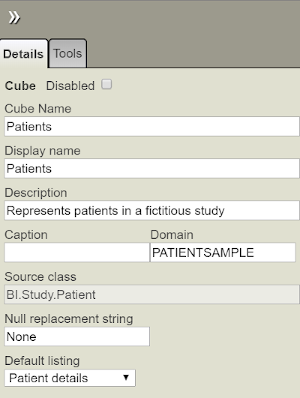 The query runs against a cube or subject area. Within the Dashboard Designer, you add pivot tables and KPIs to dashboards, along with any filter controls or other needed controls. The chapter “Basic Concepts” provides an overview of cubes and subject areas. A model can contain many additional elements. See the chapter “Summary of Model Options” for a complete comparison of the options. Create, compile, and build a basic cube with only a few items. Use the Analyzer or the Business Intelligence shell to examine the results and to identify changes to make. For information on the Analyzer, see Using the Analyzer. For information on the shell, see Introduction to InterSystems Business Intelligence. Repeat the preceding steps as necessary. When the cube is finalized or nearly finalized, define subject areas based on the cube. Note that you might need multiple cubes. You use the Architect to create cubes and subject areas. Click Analytics and then click Architect. Click Open, click Cubes, click the name of a cube, and then click OK. The top area contains navigation links and buttons to perform different tasks. Below that, the page consists of the following areas, when the Architect is displaying a cube. All properties are shown except for relationship properties, private properties, and transient properties. This display is recursive; that is, properties of properties are shown. If a property is a collection (a list or an array) or a relationship, it is shown as a folder that displays the properties of the class used in the collection or relationship. If a property is of type %List (which is the object equivalent of $LISTBUILD), it is not shown as a folder. 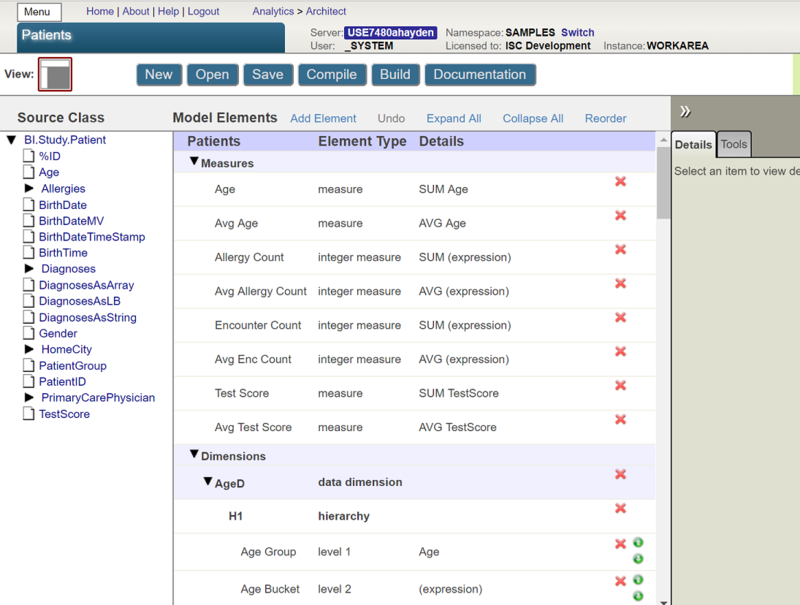 For example, see the DiagnosesAsLB property, which is included in the Patients sample to illustrate this point. If a class is not accessible from the base class via cascading dot syntax, it is not shown. All core cube elements are based either on a source property or on a source expression (which is an ObjectScript expression) that can use properties of any class. The Architect provides a useful view of the class properties, which makes it very easy to create Business Intelligence elements based on those properties. It is important, however, to know that although this view provides a convenient way to access some properties, you can also use a source expression to access any data. These source expressions are evaluated when the cube is built and thus do not affect your runtime performance. You can resize this area. To do so, drag the vertical divider on the left edge of this area. 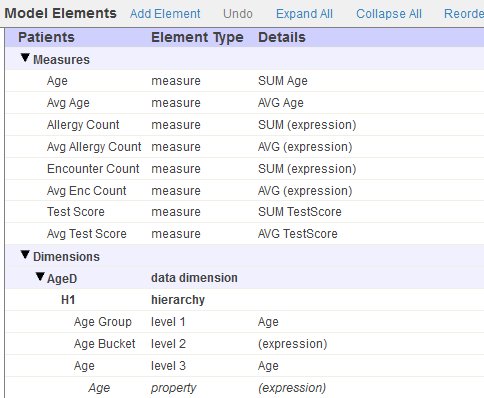 The links at the top include Add Element, which you can use to add measures, dimensions, and other items to the cube. In the area below the links, you can select items for editing, including the cube itself in the first row. You can also delete an item by clicking the X button in the row for that item. The right area is the Details Area, and it shows details for the element that is currently selected in Model Viewer (if any), or for the cube (if nothing is selected). To hide this area, click the Hide Details button . If you do so, the Model Viewer is widened. Then, to display this area again, click the Show Details button . In this area, you primarily work on the Details tab. The Tools tab provides quick access to other tools, not documented this book.